Cheryl Nichols makes her feature directorial debut with Cortez, a quietly affecting character drama set in the southwest. For every path our lives take, countless alternate paths that could have been followed branch out in our imaginations like hairline fractures. Once you've made one decision, you can think about how the other options might have shaken out, but you can never go back and make them happen in the precise manner they would have. And you can never go home again. In Cortez, wayward musician Jesse (Arron Shiver) attempts to try on the life he could have led, but chose to abandon. With his tour having just fizzled out, he decides to avoid his next publicity appointment in favor of drifting through a small southwestern town—in search of his ex-girlfriend, Anne (director Cheryl Nichols). His long-suffering friend and manager Eric (Drago Sumonja) tries to persuade him otherwise, but Jesse is that sort of blissfully stubborn breed of selfish. Unable to see anything but the immediate gratification in front of him, he shows up at Anne's workplace and shoehorns himself back into her life. Frazzled roadhouse waitress Anne is less than thrilled to see Jesse when he shows up unannounced. Their history is revealed only in fragments through key dialogue snippets, but suffice it say: it didn't end well. Jesse had a history of substance abuse and obviously retains anger issues. But, like many of his ilk (both cinematic cousins and real-life counterparts), Jesse is charming, romantic and fun. He has the ability to make those around him forgive the past, give endless second chances, and believe that things might be different this time. The gut-punch is that, at least for a brief moment, he truly believes this himself. At the beginning of the film, Jesse is having something of a profound moment in a natural hot springs with a man who tells him a story. The story involves the man stopping over in a town (Cortez, somewhere in New Mexico), unexpectedly, and ultimately remaining there for decades after falling in love with a beautiful woman and having a child. Possibly inspired by this narrative—it's unclear when the hot springs conversation takes place—Jesse discovers that his own version of this outcome has transpired without him. Anne has a son who is roughly 11 years old, and whose age and red hair mark him unmistakably as Jesse's; an offspring of whose existence the musician never had any knowledge. 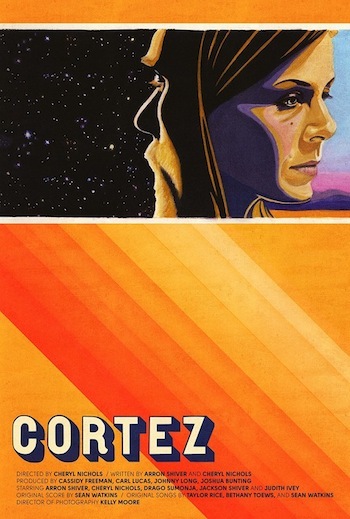 Cortez doesn't fill a niche that hasn't been adequately tackled in other films, per se. I was reminded heavily of Kenneth Lonergan's You Can Count On Me (albeit with lovers in place of siblings), which also features a beloved ne'er-do-well welcomed back into a familial fold, only to prove he may be fundamentally incapable of co-existing within it. Cortez follows this familiar trajectory, and some of the scenes can be predicted from miles away—seen in advance just as clearly as the mountains surrounding the titular town. Yet, that inevitability also lends a squirmy sense of dread and melancholy to the film that serves it well. Director and star Cheryl Nichols and Arron Shiver are romantic partners in real life, which gives their performances an ease and natural chemistry that makes their fictional history not only believable, but touching. Prolific actress Judith Ivey also gives a memorable turn as Anne's blunt, perhaps too-hospitable southern ma. Often with low-budget indies, there are two humps that need to be overcome in order for films to stand out and be taken seriously. One is poor acting—and Cortez has no problems there, as the entire cast fits into their roles like they're stepping into well-worn shoes. I would have gladly spent more time with these characters in their dreamy little desert town. The other hump? Production values. A film doesn't need to have a completely polished sheen or employ the highest-grade camera equipment to feel competent. Mise-en-scène, intuitive edits, and attractive compositions can make all the difference. Cheryl Nichols has an excellent sense of when to let the camera drift or dance, and when to minimize its presence. The southwestern landscape is effortlessly gorgeous, but it shines quietly in Cortez as a character in itself, its endless labyrinthine hills as inviting as they are mysterious and intimidating. It's not easy to find cinema that transports the viewer into a place filled with people who genuinely seem to have existed before the film begins and long after it rolls credits. Perhaps Nichols and Shiver being real-life partners who actually have ties to the region contributed heavily to this sensation—but Cortez is not a documentary, nor a home movie. It's a fully-fledged film, and a special one worth seeking out.